To many in the western world, Christmas time means honouring Christian traditions, family and friendly gatherings, plentiful foods and generous gifts. To many, but not to all. Some families and individuals in our society and our region deal with extreme situations and experience fear, loss and grief. Susan Perry, Chair of LDESA in Leduc (pronounced ‘Ladessa’) knows firsthand that this region abounds with compassionate and generous hearts. Created in 2009, the Leduc and District Emergency Shelter Association deals with extreme needs that are sometimes a short-term solution towards a better life, a first step away from the uncertainties and dark circumstances that create crippling fear, confusion and depression. Several years ago, in the Leduc and Wetaskiwin regions, there was no such thing as un-housed individuals. But as our cities have grown, the challenges and dark aspects of big city life are seen here, and LDESA is one of the local organizations that steadfastly offers support, caring and sometimes a financial hand-up to those who are referred to them and who need the extra hand up after other agencies have fallen a bit short of their goal. LDESA is comprised of three critical programs created in 2008 by Dave Mackenzie, ‘Operation Night Angel’ deals with the increase in domestic violence, offering short-term motel rooms when shelters are full and have offered a referral. The HUB is a more familiar entity in the region with an office located within Leduc’s Royal Canadian Legion. It, “fills in the gaps through referrals, complementing services offered by federal, provincial and local programs as well as those provided by the faith community.” To help individuals in crisis find employment and regain pride, the HUB offers a resume building and job search service. From September to late January, the much needed program ‘Coats for Families’ distributes hundreds of coats, hats and mittens, scarves and boots to those in urgent need of warm winter gear. In 2012, the HUB became one of the three programs under LDESA’s umbrella. Dave Mackenzie, knowing that Operation Night Angel would be in good hands, took a step back and LDESA gained another program. In December 2013, Susan Perry, previous leader of the HUB program, became the chair of LDESA. Susan Perry is passionate about the fate and protection of individuals and families in desperate times, and feels fortunate to have the support of dedicated volunteers helping out for a few hours during the week. She admits that a few more volunteers would be most welcome! 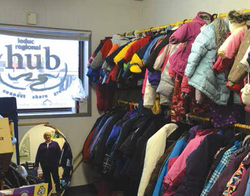 As the great collection of brand-new and gently used coats and winter apparel still awaits worthy recipients, a testament to this regional community’s compassion and generosity, the need there is still great. Donations are welcome all year-round, to support the financial help that LDESA contributes to the most critical needs of families and individuals going through hard times. Working tirelessly towards its dream of creating a centre that would offer transitional housing in a caring, non-judgmental atmosphere, LDESA also comes up with ingenious ways to raise funds, such as the recent and successful Bagging Event at Craig’s No Frills (a great community supporter) and the upcoming ‘Seeds of Hope’ Night, the second annual Dinner and Auction of April 18. LDESA’s website can be visited for more information on its programs and fundraising efforts (www.ldesa.org) and LDESA can be contacted at 780-739-5482 when other agencies’ support falls short.